By February, the 69-unit Sabbia Beach was almost sold out, at prices averaging $700 per square foot. When the 19-story Sabbia Beach condominium development opens this spring on Ocean Boulevard, it will be Pompano Beach’s first new oceanfront high-rise in 10 years. 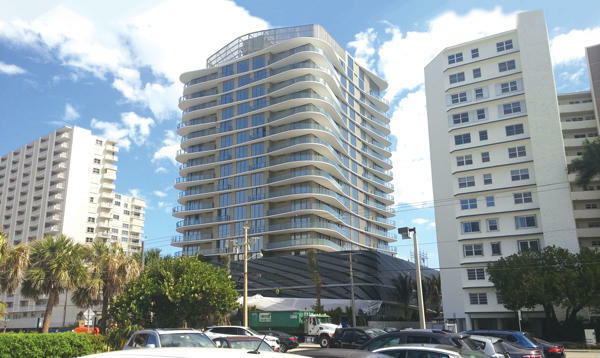 The curvy, Arquitectonica-designed property developed by Fernbrook Homes and Grupo Fernandez is scheduled to open in April along the city’s oceanfront corridor, where at least six other condo projects are planned. The 69-unit condo, which launched sales in 2015, was nearly sold out in February at prices averaging $700 per square foot, said Tara Hoyer, sales manager for the property. Many of the buyers were New Yorkers and other Northeast residents interested in relocating to a South Florida city less populated than Fort Lauderdale or Miami, where comparable new condos cost a “minimum of $1,000 per square foot,” Hoyer said. Developers such as the Related Group, which purchased a Pompano Beach plot in 2011, are encouraged by prices paid for units at Sabbia as they gauge the depth of the new condo market in Pompano Beach. For example, a five-bedroom penthouse at Sabbia sold in 2016 for about $5.5 million, the highest price ever paid for a residence in the city, according to MLS records. “The last units at Sabbia Beach sold at over $800 per square foot, which made our project much more economically feasible,” said Jorge Perez, chairman and CEO of the Related Group, the firm he co-founded in 1979 with Related Companies chairman Stephen Ross. The Miami-based Related Group, which is controlled and run by Perez, will likely be the next developer to break ground on an oceanfront condo in Pompano Beach. “That’s why we have waited until we felt the prices would justify the development,” Perez said in an exclusive interview with The Real Deal. As one of the nation’s leading condo developers, the Related Group plans to build about 100 units with direct ocean views, Perez said. Construction could start by the end of 2019 if 20 to 30 percent of the units are pre-sold at prices ranging from $700 to $800 per square foot, he added. And that’s despite the fact that the pace of Pompano Beach sales has been less encouraging. The number of condo units in the planning stages in the city’s Ocean Boulevard corridor is approximately 650 — about 10 times more than the number of Sabbia units sold over the last four years. “We are very conscious that the rate of absorption in Pompano is much slower than in Fort Lauderdale and, of course, Miami, which are much larger cities,” Perez said. Perez claimed that a surplus of unsold South Florida condos has not slowed his company’s Pompano Beach project because the tri-county area’s unsold inventory is concentrated in Miami-Dade County, not in Pompano Beach, Fort Lauderdale and the rest of Broward County. 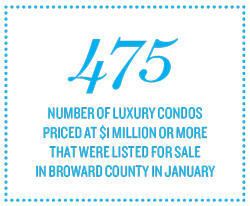 In late January, about 475 luxury condos priced at $1 million or more were listed for sale in Broward, which represented a 20-month supply based on the pace of sales in 2018. That’s compared to nearly 3,000 luxury condo listings in Miami-Dade, or a 44-month supply, Miami-based real estate research firm Cranespotters.com reported. Other developers are a ways away from breaking ground on their Pompano Beach projects. For example, Miami-based Lionheart Capital and Fort Lauderdale-based Merrimac Ventures are both developing nearly half of the planned beach-area condos in the city. “Pompano is a good value proposition right now because the cost of land has not spiraled to the heights in some other parts of South Florida,” said Ophir Sternberg, founding partner and CEO of Lionheart, which recently secured city approval to develop the largest oceanfront condo currently planned in Pompano Beach. “There’s been so little new construction in Pompano since the ’70s and ’80s, I think Pompano’s time has come,” Sternberg said. But Lionheart has already spent six years working on its Pompano Beach condo project and hasn’t yet started pre-construction sales. Lionheart acquired its 4.6-acre oceanfront development site for $22.5 million, or $4.9 million per acre, in 2013. The project is tentatively named for its Pompano Beach address: 1380 South Ocean Boulevard. In February, Lionheart got site-plan approval from the city government for a total of 239 units in two condo buildings across from each other on South Ocean Boulevard, with one located on the beach and the other next to the Intracoastal Waterway. Just north of the 1380 South Ocean Boulevard site, Merrimac Ventures, led by Fort Lauderdale-based developer Dev Motwani, has site-plan approval to build a 92-unit condo at 1350 South Ocean Boulevard. The site had been zoned for a hotel, and Motwani spent years obtaining municipal approval for a land-use amendment and rezoning. On a site across the street, Merrimac Ventures and Alliance Residential are developing a luxury rental complex with 204 apartments and seven townhouses next to the Intracoastal Waterway. The rental complex, called Broadstone Oceanside, is under construction and scheduled for completion this summer. Motwani acquired the entire 3.8-acre site on South Ocean Boulevard for his rental and condo developments for $11.5 million, or $3 million per acre, in 2011. But construction of the condo development may not start before 2021. Pre-construction sales for the 92-unit condo building will be launched after the Broadstone Oceanside rental development is “finished, stabilized and rented out,” said Motwani, who expects to offer the condo units at prices above $700 per square foot. “We’re currently on hold just because it’s a lot harder to sell condos while you have construction across the street.” Motwani denied that a glut of unsold South Florida condos was responsible for the delay, citing the concentration of the tri-county area’s unsold inventory in Miami-Dade.